Looking for an unusual outing for friends and family who don’t all share the same interests? Seeking an edifying adventure for your club members? Dotmaker Tours are a pleasurable and unexpected way to bring friends and family together while you’re making creative discoveries, learning about pressing contemporary issues and exploring London. All our tours are designed to trigger conversation and insight. They offer new perspectives on the city and richer ways of looking at the world at large. 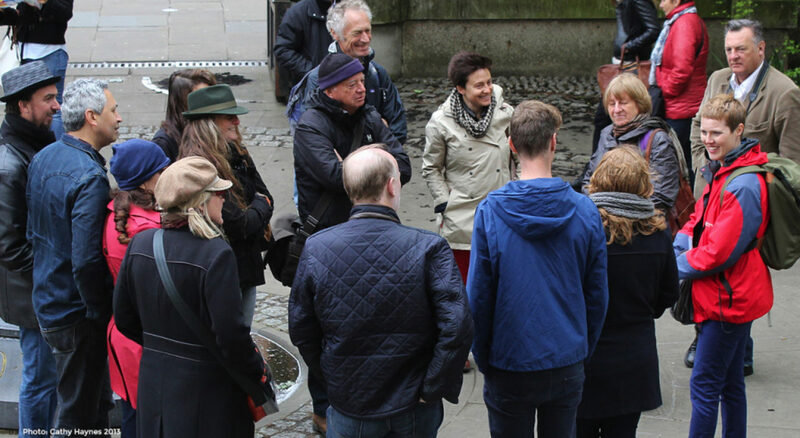 All our walking tours are available for groups throughout the year: see the list below. They take place in central London, the City, Greenwich, and the Isle of Dogs just south of Canary Wharf. They can be organised to suit your schedule. Whether you’d like to make your tour part of a breakfast outing or wrap it around lunch, we can advise on the best places to eat and drink nearby. The walks are led by fully insured guides, Rosie Oliver and Cathy Haynes. A life-long Londoner, Rosie founded Dotmaker Tours in 2012. She also produces spoken audio features for Tickertape Productions. Rosie has a background as an environmental lawyer. Cathy Haynes is an artist-curator and founding faculty member of The School of Life. Cathy leads A Genius Tour. Interested in booking a private tour? Drop us a line to let us know what you’re looking for and your dates, and we’ll take it from there. For the full details of each tour’s content and location, click on its title. • The London Ear – Listen your way through the City with extraordinary tales and playful experiments. Find out about the capital’s defining Cs and B flats, why you can hear Bow Bells in Cambodia and what future cars could sound like. • The Greenwich Bestiary – Gain a fresh perspective on this much-loved historic site. Be entertained by whimsical facts and intriguing stories about the animals of Greenwich, from Pelican crossings to Henry VIII’s jousting horse. • A Genius Tour – Follow in the footsteps of visionaries to blow apart the myths about genius. Make playful experiments that spur your creativity. Find the riches no one else is looking for in the heart of London. • London In Slow Motion – Move against the flow of the hyperactive city and find the hidden spaces of calm. • A Power Trip – Do some counter-surveillance on the forces that control and influence us, from discovering who is behind the CCTV cameras above our heads to visiting a court of law in action.